246 Commonwealth is located on the south side of Commonwealth, between Fairfield and Gloucester, with 29 Fairfield to the east and 250 Commonwealth to the west. 246 Commonwealth was designed by George Alden Avery, architect, and built in 1880-1881 by Vinal & Dodge, masons. George Avery also was shown as the owner on the original building permit application, dated March 11, 1880. 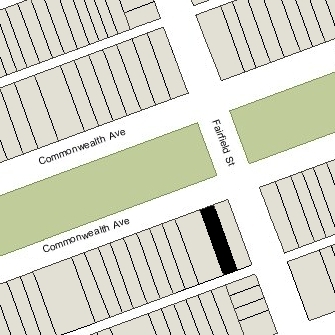 George Avery purchased the land for 246 Commonwealth on March 2, 1880, from the estate of Charles A. Smith, a merchant tailor, who had died in January of 1880. He had purchased the lot on December 18, 1877, from banker and real estate investor Asa Perkins Potter. Asa Potter and his wife, Delle (Sheldon) Potter, lived at 29 Fairfield. The lot was part of a larger parcel which also included the land between the alley and Newbury, where Asa Potter built 31-33-35-37 Fairfield in 1877-1878. All of the land was part of a parcel previously owned by Nathan Matthews, part of an even larger tract which was purchased by Nathan Matthews on January 2, 1871, from David Sears, Jr., Frederick R. Sears, and Knyvet Sears. Click here for an index to the deeds for 246 Commonwealth. On August 18, 1880, while 246 Commonwealth was still under construction, it was purchased from George Avery by boot and shoe manufacturer Charles Buffum. By the 1881-1882 winter season, he and his wife, Mary Elizabeth (Nutting) Buffum, had made it their home. They previously had lived at the Hotel Pelham (southwest corner of Boylston and Tremont). The Buffums continued to live at 246 Commonwealth during the 1886-1887 winter season, after which they moved to the Hotel Vendôme. On March 24, 1887, 246 Commonwealth was purchased from Charles Buffum by Frank Ernest Simpson, a carpet manufacturer. He previously had lived at the Hotel Huntington (Huntington at Blagden). He continued to live at 246 Commonwealth until his death in May of 1916. He was unmarried. On February 28, 1918, 246 Commonwealth was acquired from Frank Simpson’s estate by his sister, Helen (Simpson) Seely, the widow of Dr. William Wallace Seely. She lived in Cincinnati. The house was not listed in the 1917-1926 Blue Books. On October 3, 1923, 246 Commonwealth was acquired from Helen Seely by Harry Brackman, a motion picture projectionist. The property changed hands and on August 1, 1924, was acquired by Domenico Vassallo, a tailor and dressmaker, and his wife, Mary Vassallo. 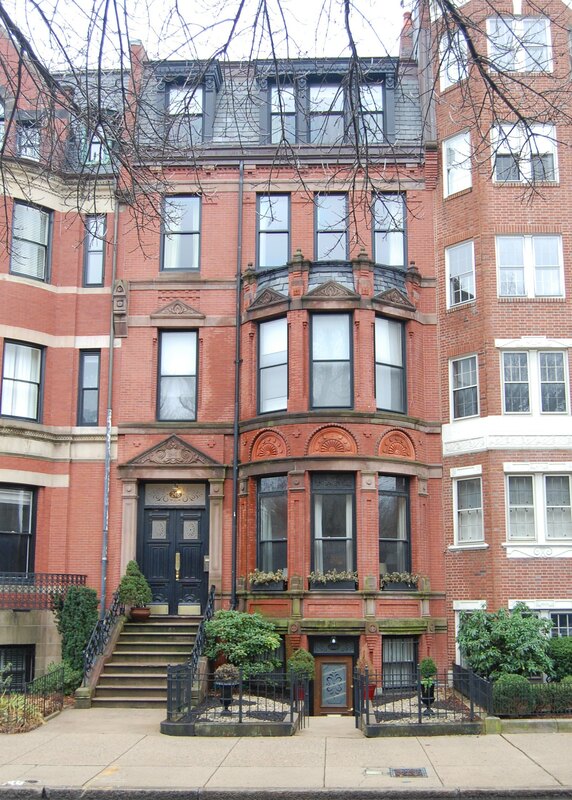 They previously had lived at 729 Boylston. In November of 1924, he was cited by the Building Department for converting the property into a dressmaker’s shop and multiple dwelling without a permit. On April 1, 1925, 246 Commonwealth was purchased from the Vassallos by Dr. Bradford Nelson Powell, a dentist. He and his wife, Sarah Louise (Bradbury) Powell, made it their home and he maintained his dental office there. They previously had lived in Wilmington, and he had maintained his dental office at 15 Bay State Road. In May of 1925, he applied for (and subsequently received) permission to convert the property into a residence and offices for physicians and dentists. The Powells operated 246 Commonwealth as a lodging house. Living with them, as lodgers, were Ralph Henry Doering (Doehring), a salesman, and his wife, Marion Nettie (Clark) Doering, and Dr. Edwin Parker Hayden, a physician and surgeon, who maintained his medical offices at 270 Commonwealth. In about 1927, the Powells moved to Harwichport and he moved his dental office to 234 Boylston. Dr. Hayden married in March of 1928 to Ruth Chivvis (a former lecturer on the Bible at Lindenwood College in St. Charles, Missouri) and they moved to Brookline. And Ralph and Marion Doering moved to 477 Commonwealth. On June 1, 1927, 246 Commonwealth was acquired from Bradford Powell by Lunetta V. Nickerson. It continued to be a lodging house. On December 15, 1927, 246 Commonwealth was acquired from Lunetta Nickerson by Justine Frances (Houghton) Kershaw, the wife of Francis Stewart Kershaw, an expert in Chinese and Japanese art. They lived in Cambridge. On September 28, 1928, 246 Commonwealth was acquired from Justine Kershaw by The Girls’ Friendly Society, an international organization affiliated with the Episcopal Church which provided lodging for unmarried young women. The Society also owned and maintained its Lodge next door at 29 Fairfield, and converted 246 Commonwealth into a dormitory. 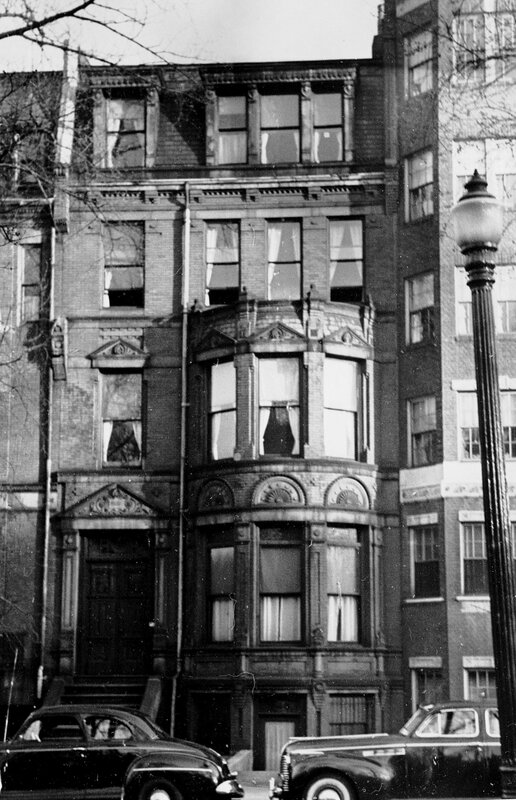 The Girls’ Friendly Society continued to be located at 29 Fairfield and 246 Commonwealth until about 1942. On July 23, 1942, 246 Commonwealth and 29 Fairfield were acquired from The Girls’ Friendly Society by Francis J. Dempsey. He was an elevator operator and probably acquired the property on behalf of attorney and real estate investor Maurice Eli Goldberg. In April of 1943, Francis Dempsey applied for (and subsequently received) permission to convert 246 Commonwealth from a dormitory into a lodging house. On the same day, he also filed to convert 29 Fairfield from a private school and lodging house into a lodging house. On July 23, 1943, Francis Dempsey transferred 29 Fairfield and 246 Commonwealth to Maurice Goldberg’s wife, Kate D. (Byer) Goldberg. On April 26, 1944, Kate Goldberg transferred 29 Fairfield and 246 Commonwealth to real estate dealer Ray C. Johnson, and on September 22, 1944, he transferred both properties to William A. Sargent. In both cases, the property was held on behalf of the Goldberg family. On November 12, 1947, William Sargent transferred 29 Fairfield and 246 Commonwealth to Walter Gainey, who also held them on Maurice Goldberg’s behalf, and on March 9, 1969, Walter Gainey transferred both properties to Maurice Goldberg as trustee of the Maurice E. Goldberg Charitable and Educational Trust. 29 Fairfield remained the property of Maurice Goldberg — one of a number of holdings of the Maurice E. Goldberg Charitable and Educational Trust — until his death in July of 1972. On July 22, 1976, the trust sold 246 Commonwealth to his son, Richard H. Goldberg (of Tuckahoe, New York). At the same time, it also sold him 113 Commonwealth and 207 Commonwealth, and sold his sister, Barbara (Goldberg) Weingarden (a resident of St. Louis, Minnesota), 234 Beacon and 29 Fairfield. On August 31, 1979, 246 Commonwealth was purchased from Richard Goldberg by Washington Investment Services, Inc. In January of 1981, it filed for (and subsequently received) permission to legalize the property as eight apartments, stating that to have been the existing condition since 1955. 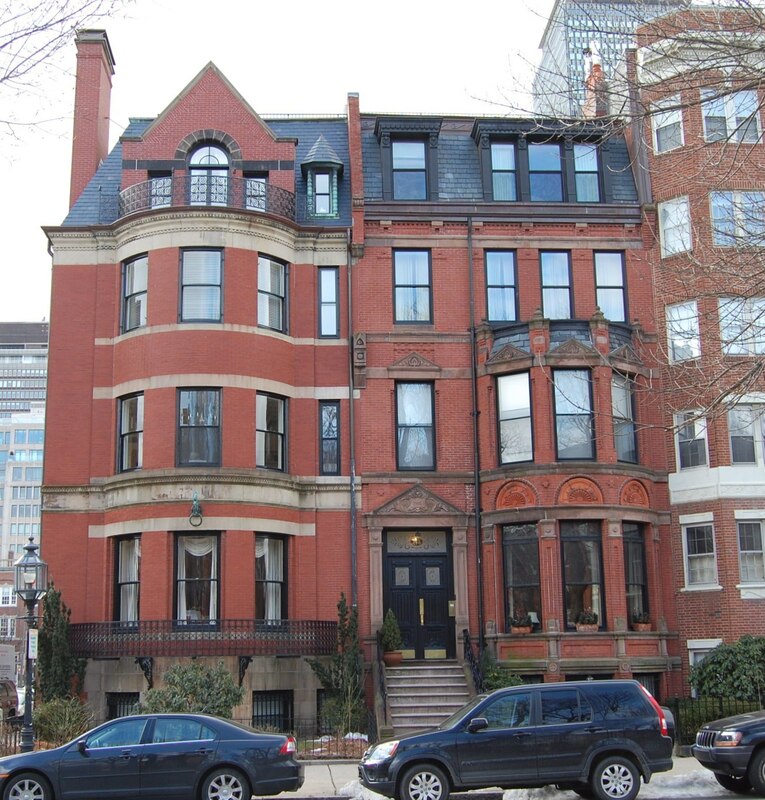 On December 21, 1981, Washington Financial Services converted the property into eight condominium units, the 246 Commonwealth Avenue Condominium. In February of 1983, Washington Investment Services filed for (and subsequently received) permission to reduce the number of units from eight to six. In September of 1983, Ronald Luccio, a unit owner, filed for (and subsequently received) permission to construct a 20 foot by 25 foot penthouse. On November 14, 1983, the condominium master deed was amended to reduce the number of units from six to five, and on October 8, 2010, the master deed was amended again to reduce the number of units from five to four.